It was a quiet night at the Aire in the town, just the sound of the owls at night and birdsong in the morning. I heard the church bells of St Martin strike eight and got up half an hour later. I switched on the hot water for Cathy and walked out into a cold but clear morning, with blue sky and the sun about to rise over the rooftops. Considering this is a town, it was fairly quiet as people made their way to work or opened shops. I walked down towards the main square looking for somewhere to buy salad, but couldn't find one. But I did go into the boucherie to buy lamb chops and some local sausages, then walked back up to buy a baguette and a croissant. I fancied a coffee and found a bar that was open and quite busy. I walked in, offered the usual 'Bonjour' to everyone and stood at the bar to order un crème. Here it comes with the hot milk in a separate jug. I stood and took my time over my coffee, listening to the conversations and trying to pick out words and phrases. I managed to pick up the odd word here and there, such as asking how much for two coffees and an orange juice. When it was time to pay I asked how much and the bar owner replied in fast French; I picked up the 'trente' at the end, so guessed the rest and gave him €2.50. He returned €1.20, so I missed the beginning but at least I know a coffee should be under €2. 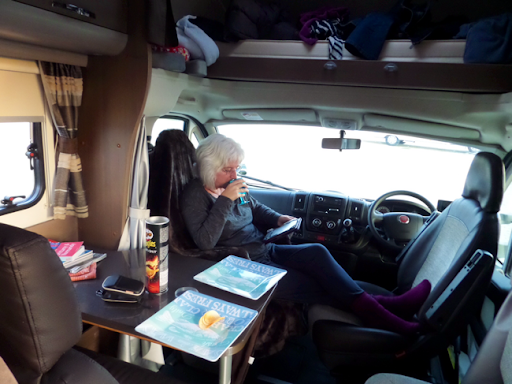 Back at the van Cathy was showered, had tidied up and had the kettle on. 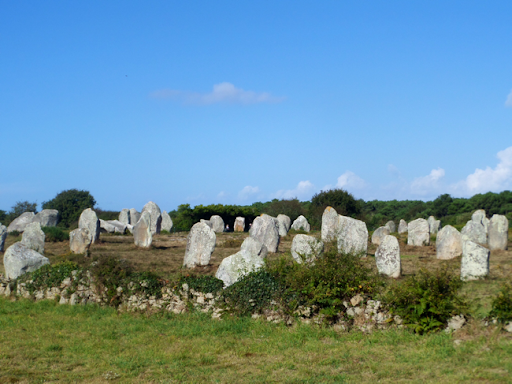 After breakfast and with everything stowed away, we moved across to the service point to drop waste and headed off for our next stop - Carnac and the menhirs or alignments of stones. 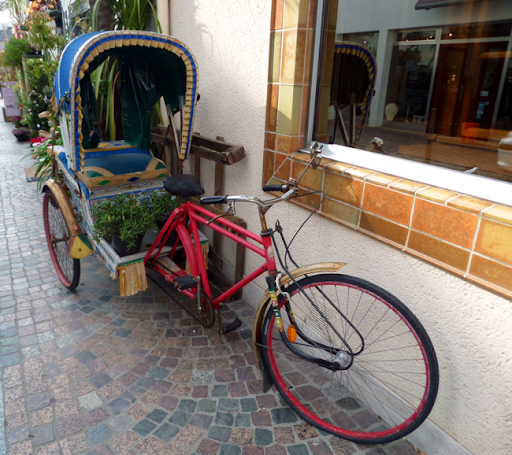 There was an Aire in the town so we planned to stay there if we liked it. It was only an hour's ride and we passed the stones on the outskirts of the town. 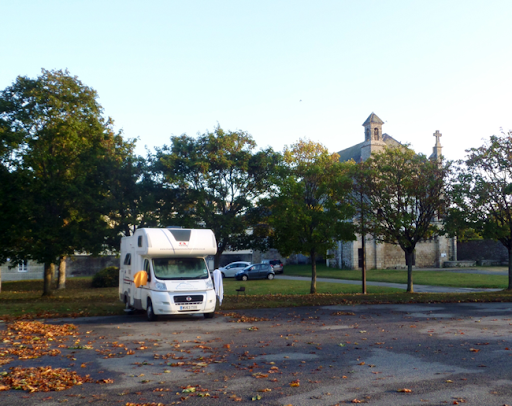 We found the Aire but it was mainly just a car park in town and it didn't feel a nice place to stay overnight, so we decided we'd visit the alignments and find somewhere else to stay. 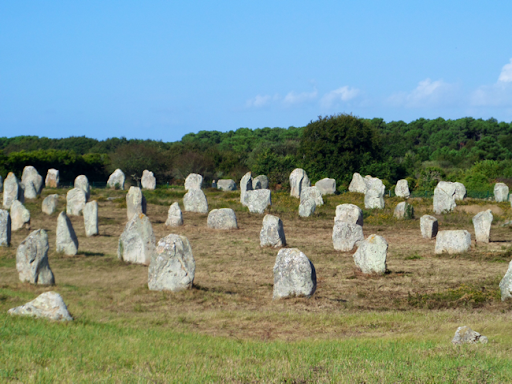 The alignments we wanted to visit were only a short 10 minute walk away. 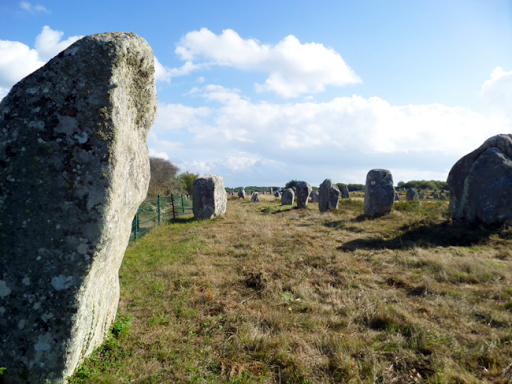 Carnac is the most important prehistoric site in Europe - in fact this spot is thought to have been continuously inhabited longer than anywhere else in the world. 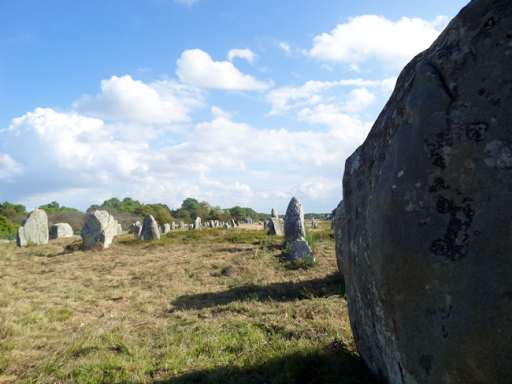 Its alignments of over two thousand menhirs (standing stones) stretch over 4km, with great burial tumuli dotted amid them. In use since at least 5700 BC, the site long pre-dates Knossos, the Pyramids, Stonehenge and the great Egyptian temples of the same name, Karnak. 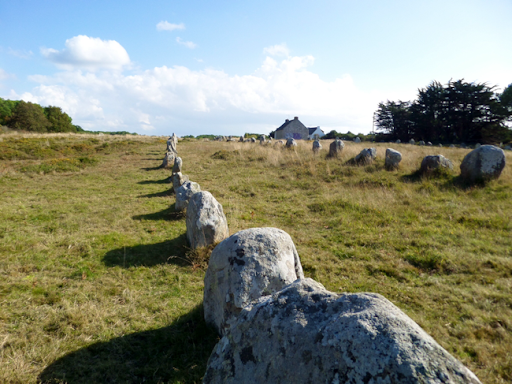 Unfortunately they're fenced off so we couldn't walk amid them, but we did walk around a section, with a view of the long straight lines of stones as far as the eye can see. We also managed to touch some of them - surreal as we thought about their age, history, use and reason to be there. We both have an affinity with this spiritual aspect of life more than any formal religion; the power of the earth and physical energy. Hopefully being at this spot will bring us some good health and luck. On the way back we stopped at Lidl and bought a few goodies, including 2 litres of rosé for less than €4 - the expensive stuff as Ian described it in a text! I dialled in the coordinates for an Aire on the outskirts of Quiberon, which was only 25 minutes away, and headed off in warm sunshine. The drive along the Quiberon peninsular was lovely - wide sweeping roads with the sea pounding on the rocky shore to our right. The coast here has two quite distinct characters. The Côte Sauvage, facing the Atlantic to the west, is a bleak rocky heathland, lashed by heavy seas. 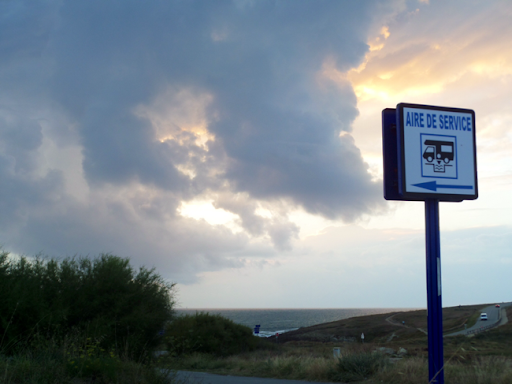 The sheltered eastern side, however, the Baie de Quiberon, contains safe sandy beaches, as well as the many Thalassotherapy Institutes that line the Breton coast. The Aire was quite empty and I picked a spot with a view of the sea and the main door facing west. Out came 'our' outdoor table and we enjoyed a tasty lunch sat in the sunshine, with a couple of glasses of the 'expensive' rosé! All cleared away and, with the sun shining, we locked up and crossed the road to join the coastal path heading towards Quiberon town. We passed a restaurant and a small 'Le Moutiere', a possible lunch stop tomorrow for (finally!) some Moules frîtes. We carried on along the coast, enjoying the warm breeze and sunshine, and surprising quite a few small geckos as they dozed on the sun-warmed rocks. The town of Quiberon is quite touristy, but with a working fishing port and plenty of good places to eat. Cathy had a paddle while I went to buy her some patisserie. We wondered around the town but were soon heading back along the coastal path. 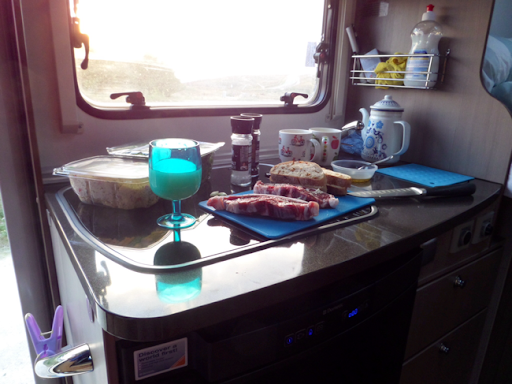 Back at the van, we sat outside with a wet and the cakes - almond & pistachio gateaux - a bit heavy according to C. After that we sat with an Apero watching the sea, before I lit the BBQ. Dinner tonight was lamb leg chops with lamb's lettuce, tabbouleh and toasted bread rubbed with garlic and olive oil, all enjoyed with some more of the Lidl rosé. 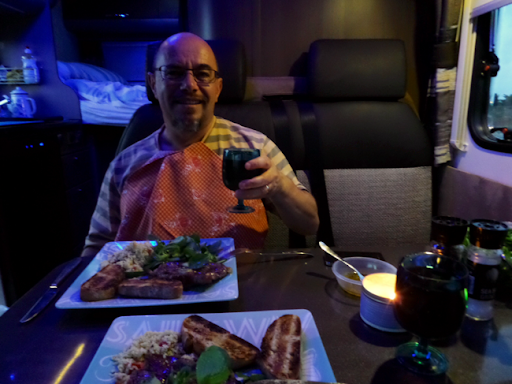 It was a lovely evening and I sat on the step watching the sunset as the chops cooked, flavoured with the wild fennel stalks Cathy had picked, thrown on the coals. Washed up and squared away, it was time to chill out and enjoy a quiet night by the sea. 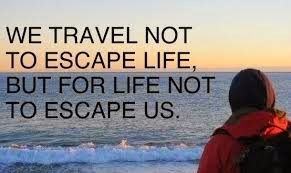 Hopefully tomorrow I'll get out for a bike ride in the morning before we head off along the coast, moving in to the Pays de Loire region. 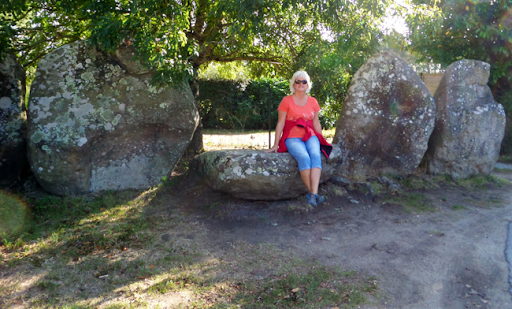 Soaking up the magic of the stones!